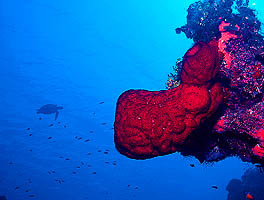 e-ReefNews Volume 5 Number 3 for more info about the Cayman Islands. Endangered Hawksbill Turtles get big eating Sponges, so it is cool to get both of these creatures in the same picture! Click here to see this picture up close. 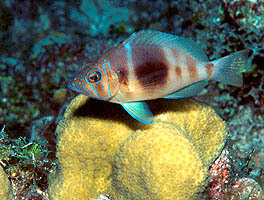 The little Barred Hamlet is a relative of the huge Groupers. Click here to learn about this flamboyant fish.